Howdy! For those of you living above the equator-- how's summer so far? I'm slowly recovering from illness (hooray!) Our days are packed with swim classes, trips to the library, play dates, and night time walks. Is it just me, or is summer just as busy as the rest of the school year? Lately, I honestly haven't had the time (or energy) to craft. (Do you ever feel that way too?) 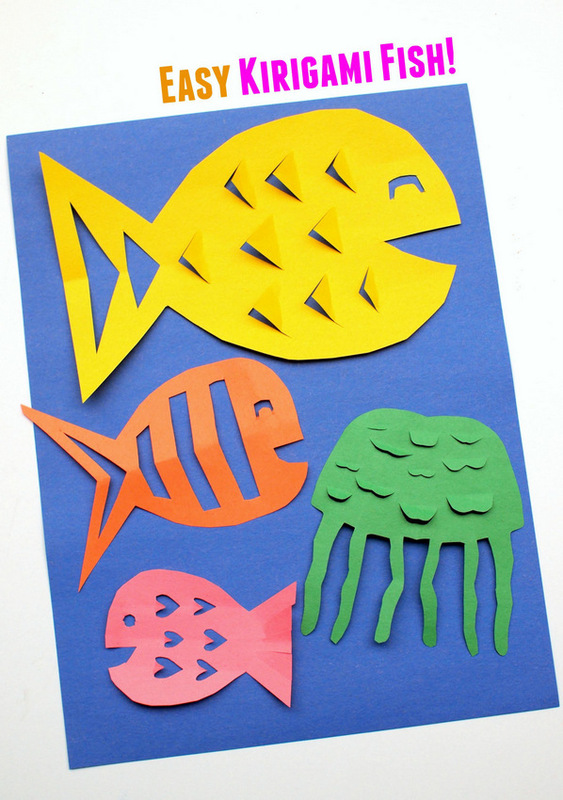 Well, in case you wanted a quick, summer craft to do with the kids, I'm sharing this easy kirigami fish craft today! I've always enjoyed paper cutting and folding crafts, so I thought this was a really great way for young children to get creative with scissors and paper too! Let's make some Kirigami Fish! To cut out a fish, simply fold your paper in half horizontally. Then, cut out half a fish. When you open up the paper, you should get a symmetrical fish! I simply folded the paper in half and then cut out rectangles, made curved cuts, and made slanted cuts. Then, I unfolded the paper and pushed the cut out bits upwards. Instead of simply folding my fish in half, I also folded them into fourths to make more cuts. To do this, I simply folded the fish in half. Then, I opened up the fish and folded both sides to meet the middle folded line. Then, I made my slanted cuts. Tada! I love this craft because there are so many opportunities to explore, cut, and fold. What kind of designs can YOU make? I hope you have fun trying out this kirigami activity with your children too! Pssst- Dig ocean themed kids crafts? Well. You're in luck! Today's post is part of a Collaborative Series of Ocean Crafts! Here are 10 other fun ocean crafts from some crafty kid bloggers!